It is from his grandfather, a sculptor, and from his father, a marble craftsman, that Nicola Gagliardi (born 1944) inherited the basics of stonemasonry. Later on he attended the Accademia di Brera in Milan as a pupil of talented medallist Ettore Calvelli, graduating in 1967. He then became a self-employed professional and frequented the studios of sculptors Carmelo Cappello and Riccardo Pitter and of painters Gino Moro and Domenico Purificato. Early on his activity took up two directions: the creation of personal works on specific themes and of commemorative monuments on one hand, and, in parallel, replica and restoration work on historic sculptures. With his own creations Gagliardi has since 1966 contributed to over 150 collective exhibitions and set up 22 solo shows. A number of these works are also on display in municipal collections and museums of contemporary art in towns like Ascoli Piceno, Gallarate (Varese) and La Spezia. While over the years his multi-faceted sculpting experience has led him to explore special themes such as “the dream”, “maternity”, “waiting”, “lovers”, “jugglers”, “horses”, “bathers”, “the sea”, “hills”, his more recent research focuses on surrealistic and metaphysical motifs, some examples being “The Thinker” and “The ten dreams of André Breton”. - the bronze doors for the parish church of San Vittore Olona (Milan), his hometown, entitled “The Beatitudes” and inaugurated in 1997. More recent work includes two high-reliefs in white Carrara marble, called “Reading” and “Writing”, created for the “Tirinnanzi” School Complex in Legnano (Milan) and inaugurated by Lombardy’s Governor Roberto Formigoni in 2007. Also inaugurated by Formigoni in 2010 is the bas-relief in gilded stone for the entrance hall of the Oncology Department at Milan’s “Sacco” Hospital entitled “On either side of the tree”. 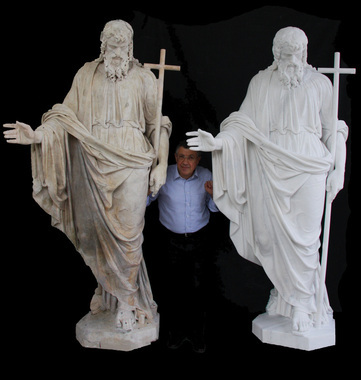 On the other front, that of statue replicas, in 1984 Gagliardi had the honour of being called to work for the “Veneranda Fabbrica” of Milan Cathedral and his fruitful collaboration continues to this day. Most of the sculptures that the artist replicates come from the apse’s bays and from the transepts, terraces and spires. All of them are now beyond recall due to weathering and air pollution, often with extensive parts missing. Among the most important replicas of the Cathedral’s sculptures are the Candoglia marble statue of Saint Ursula (original by Giuseppe Grandi, 1869) and the elegant statue of Saint Ignatius Loyola (original by Pompeo Marchesi, 1855). In 1995 The Ministry of Culture and Heritage commissioned Gagliardi to make replicas of two statues: Saint Luke the Evangelist (original by Grazioso Rusca, 1810) and King David (original by Luigi Acquisti, 1809), standing in the central bay of Milan Cathedral. The latest work of this kind, a replica of the statue of Saint Philip the Apostle (original by Pompeo Marchesi, 1812) was placed on the Cathedral’s façade at the end of its extraordinary restoration. Gagliardi has devoted special attention to the restoration and conservation of sculptures. Among his private clients are Banca Cariplo, who commissioned him to restore the Carrara marble statue of “Marchesa Virginia Busti Porro” (by Vincenzo Vela, 1871) and the sculpted group “Los Emigrantes” (1890), and Milan’s “Poldi Pezzoli” Museum, who entrusted him with the conservative restoration of Alceo Dossena’s high-relief of the Virgin of the Annunciation. For a public body, the Municipality of Legnano, he has restored the local bronze “Monumento al Guerriero” (by Enrico Butti, 1900). In 2000 Gagliardi held retraining and refresher courses for 150 museum attendants of the Municipality of Milan, and in recent years he has lectured on the subject of “Statue decay – restoration and replicas” for cultural institutions including “Italia Nostra” and “F.A.I.” (Italy’s National Trust).